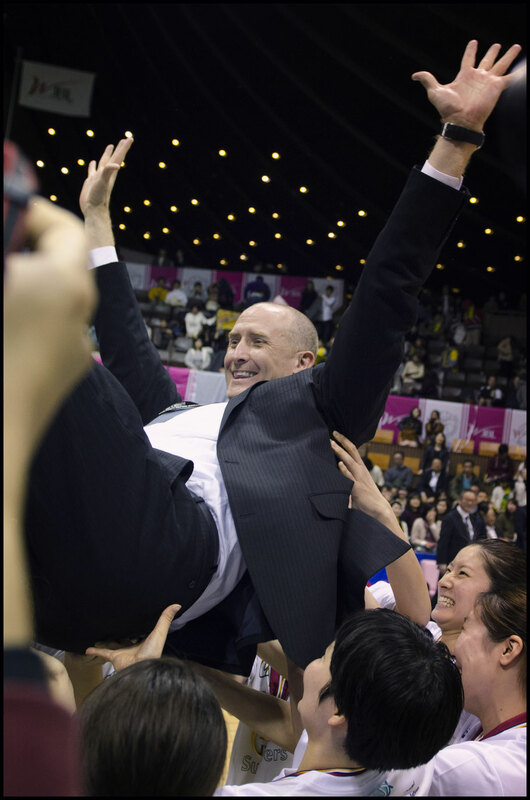 With the exception of losing the opening tipoff and his star player early in the second half - the latter being much more serious, but in the end, also not much of a factor--there was little that concerned JX-Eneos Sunflowers head coach Tom Hovasse as his team finished off the most dominant season in the history of the Women’s Japan Basketball League. JX-Eneos capped a perfect season by routing the overmatched Toyota Antelopes 75-51 on Sunday at Tokyo's Yoyogi No. 2 Gym, completing a three-game sweep of the best-of-five WJBL championship finals for their ninth consecutive crown. The Sunflowers became the first-ever team to completely run the table in a season, finishing 38-0 after winning every regular-season and playoff game in the league while capturing the All-Japan tournament title for the fourth straight year. "We have competition," Hovasse insisted. "This year was a little bit different. We didn't have any major injuries, we were just very lucky. A very fortunate season. One time in a 100 years you get something like this." Just how dominant was the team, which includes four members of the Japan squad that made the quarterfinals at the Rio Olympics? Only one of those 38 victories was by less than 10 points, and in that 69-63 win over the Yamanashi Queen Bees on Oct. 16, the team was missing superstars Ramu Tokashiki and Asami Yoshida. "This is the 10th final I've been in in my career, I think that's the best team that I've ever had to coach against," Toyota head coach Don Beck said. "And they certainly deserved to go undefeated." 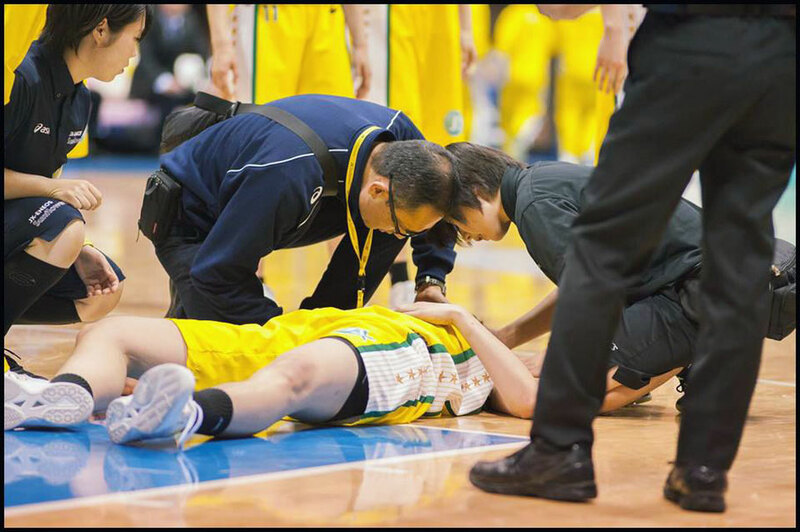 Tokashiki, arguably the best player in league history who spends the offseason with the Seattle Storm of the WNBA, was literally knocked out of Sunday's game a minute and a half into the second half when she bumped heads hard with Toyota's Mika Kurihara. She was taken off on a stretcher, then watched the rest of the game from the sidelines. The center-forward did not wait around for the awards ceremony, in which she was named the league MVP and a Best V selection, and was whisked off to the hospital with symptoms of a concussion. Hovasse said later she underwent a CT scan and would be fine. 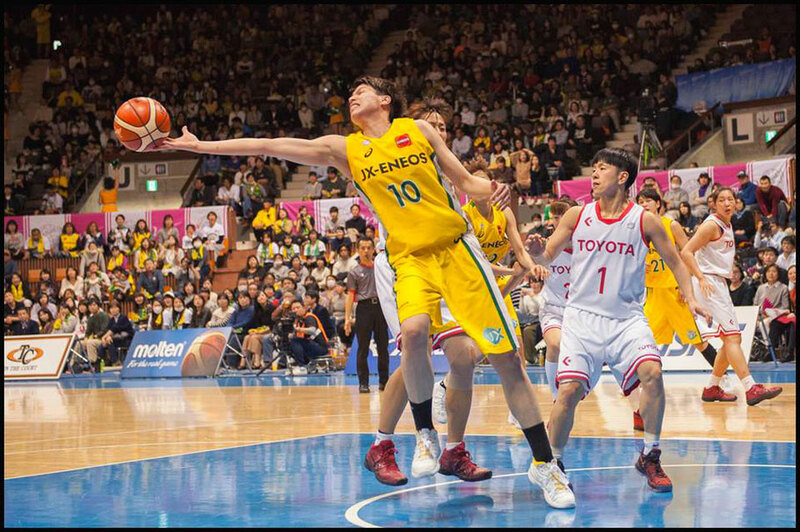 The Sunflowers were leading 38-19 at the time, with the 193-centimeter Tokashiki playing a limited role in the offense with just six points, but having pulled down 10 rebounds and blocked two shots. "I was really concerned," Hovasse said. "It was a 19-point game with 18 minutes left, that's a long time. But we outscored them from that point on. I'm very happy with that." One of Hovasse's objectives when he took over as head coach this season after seven years as an assistant was to create a team culture that challenged everyone, from the stars down to those on the end of the bench. And the way the others picked up the slack reflected the hard work they all put in. "It's not easy to coach these girls at this level," said Hovasse, who was recently named head coach of the Japan national team. "They need to be challenged. After Rio, we have superstars and we have our bench players, and there's a huge gap in the middle. And I wanted to get that gap smaller. Our bench members did get a lot better as the year progressed." Part of the challenge was revamping all aspects of the team's approach to the game. "We completely changed our defense, we completely changed our offense. Last year, we shot the least amount of 3s in the league, made the least amount of 3s; this year, we shot the most 3s, and we were third in makes. And our shooting percentage overall didn't go down." Hovasse might have had the usual pessimistic concerns of a coach when Tokashiki went down, but deep down he was confident. "We've created a team that's all about the team," he said. "When she went down, (Aiko) Ishihara came in and just did a fabulous job. She's a different type of player, but she did a great job. And then (Saori) Miyazaki came in off the bench and was fantastic." Miyazaki finished with 14 points, tied for team-high with Yoshida, while Ishihara chipped in nine points. Yuki Miyazawa also scored 14 points off the bench, including sinking three 3-pointers. Yoshida, the team's bleached-blonde dynamo of a point guard, was named the tournament MVP. After winning the first two games of the series 84-53 and 74-63 on the southern island of Kyushu, the Sunflowers came out firing against an Antelopes team that seemed to freeze like deers in the headlights. Toyota did not score in the first 3 1/2 minutes and ended the first quarter trailing 17-5. After becoming one of the few teams to win the opening tipoff against the Sunflowers, Toyota then drew a foul just seconds later. But perhaps as a sign of things to come, Saki Mizushima--the league-leader in free throw percentage--missed both shots. "It was probably the worst start in a game that could decide a championship," Hovasse said. "Usually we win the tip, we didn't. I thought they traveled. Then they got a foul and free throws, and missed them both. It wasn't the start we had hoped for, but once they missed them, we were fine." For the game, Toyota shot just 29.5 percent from the floor, made just 6 of 24 3-point attempts and were 7 of 13 from the free throw line. 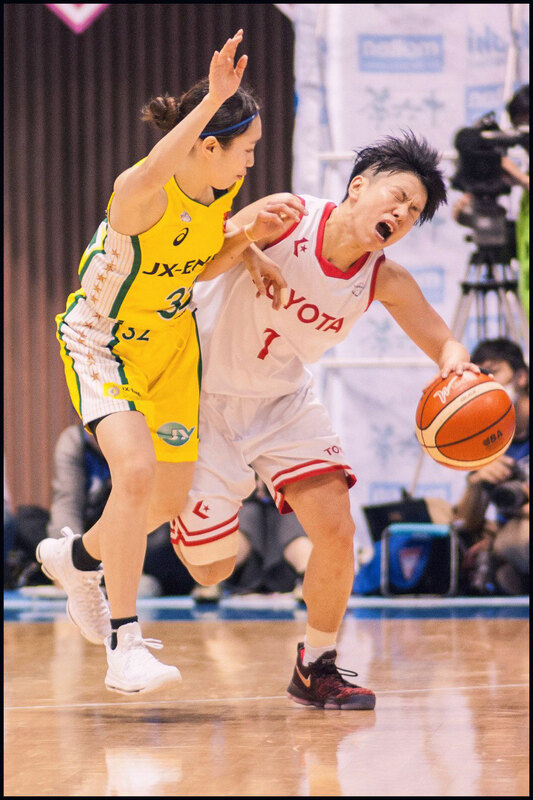 Having trailed by 33 late in the third quarter, the final score would have been much worse had veteran guard Yuko Oga, a former Sunflowers star, not sank three 3-pointers in the fourth quarter, in which Toyota scored nearly half (23) of its total points. "I'm happy we were able to play hard to the end," said the 34-year-old Oga, who also had a stint in the WNBA with the Phoenix Mercury. "All people have wants and at the end, we wanted to win and have others say congratulations to us. This will be a harsh memory, but last season we lost in the quarterfinals, and we aimed to make it to the final this season. We are taking it one step at a time and still on the way up." Asked whether it was the JX-Eneos defense or the big-game pressure that caused Toyota's dismal shooting, Beck said it was combination of the two. "In the case tonight, they played very good defense, but we had a lot of open looks in the beginning," he said. "When the shots don't fall, you start to get tight and I think that really affected us. I didn't want to play uphill the entire night, but that's what we were doing." Still, looking at the big picture, Beck had nothing but praise for the effort his team made to finish 20-7 in the regular season and get to the finals for the first time since 2013. "I want to tell you how extremely proud I am of my team. It was one of the best groups of people that I've ever worked with...For us to get through the season, finish in second place and get to the finals, is an amazing achievement. Every one of those girls who wore a Toyota uniform deserves credit for what they accomplished this year." Like Hovasse at JX-Eneos, Beck has been making a transformation at Toyota since taking the job two years ago. He previously was coach of Toyota's men's team (now called Alvark Tokyo of the B.League), which he led to a league title in the 2011-12 season. The majority of women's basketball players in Japan join their teams right out of high school, and the teams install them in a military-like living environment of dormitories and restricted lifestyle. Beck's first order of business was the change that, and he feels the runner-up finish vindicated his methods. "The other thing I'm extremely pleased with and proud of is how we achieved our success this year. For those of you who don't know much about women's basketball in Japan," he explained at the post-game press conference, "there is a certain mindset to practice and work and lifestyle that most women's teams are structured with. A lot of the teams are run like labor camps." When that last phrase tripped up his translator, he added, "They're very, very strict and very, very hard." Beck continued: "What we did with Toyota...we tried to make the practices fun, we tried make what we did enjoyable. We tried to make the work important, but we took in every other factor of living, and I'm really pleased that that method was successful. And hopefully we continue to grow and get better." Assured that Tokashiki was going to be alright, her teammates had some fun in her absence during the awards ceremony. 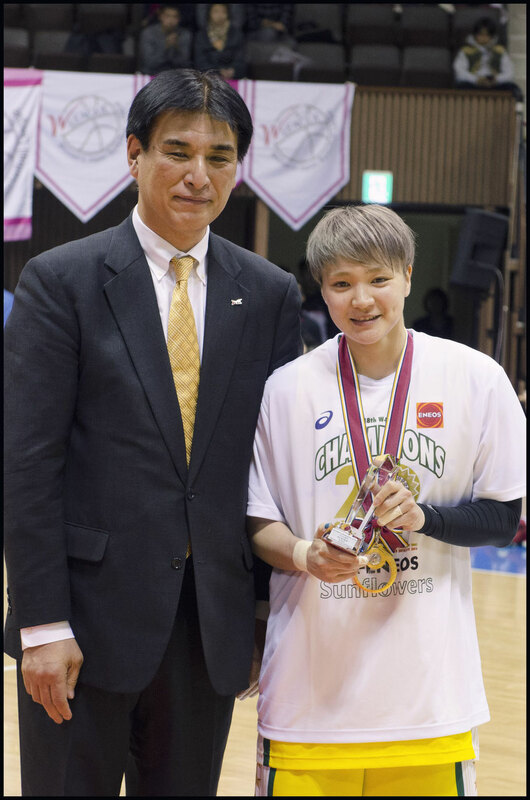 Every time Tokashiki's name was called--she also collected honors as a tournament Best V selection and for leading two regular-season categories (field goal percentage and blocked shots)--the team sent out Sayaka Okamoto in her place. At 161 centimeters, Okamoto could hardly be more of a contrast to the skyscraping Tokashiki. But she played along, high-fiving her teammates before heading out to center court to collect the trophy and pose with a dignitary. Perhaps people a hundred years from now who see photos from the awards ceremony will be puzzled at how the diminutive player named Tokashiki could have been so dominant. But when they look at the Sunflowers' record from that season, there will be no doubt of who were the absolute rulers of the league. Said Hovasse, who was star shooting forward for Toyota in his playing days, "I think we're one of the best teams I've seen here, for sure."